The Turnbull Government's requirement for a postal plebiscite on marriage equality but not for sending troops to North Korea only reinforces the importance of voting "Yes", says John Passant. IF YOU ARE reading this, it means Donald Trump and Kim Jong-Un haven’t blown up the world. Yet. As part of the escalating tensions, Field Marshall Lord Turnbull declared Australia was – in words reminiscent of Andrew "to our last man and our last shilling" Fisher in 1914 and Robert "melancholy duty" Menzies in 1939 – joined at the hip with the Trump-led United States. Echoing Harold Holt, it is now all the way with Donald J. Prime Minister Turnbull invoked the ANZUS Treaty to announce we would fight alongside Trump (or rather the Americans that Trump would sacrifice) in any war with North Korea. The ANZUS Treaty, however, only requires that the parties consult together. Turnbull has jumped the gun, so to speak. It took Turnbull just a few moments to commit Australia to war against North Korea. No debate, no discussion, no Parliamentary approval. Just Turnbull on his own, joining the rest of us up to possible nuclear Armageddon. Democracy anyone? How about a plebiscite on this war, Mr Turnbull? Compare that "decisive" and anti-democratic action to Turnbull’s less than decisive and anti-democratic action on equal love. Years of prevarication, manoeuvring and delay by conservatives and Labor have found expression in the current, deliberately created Turnbull Government inaction. This could, of course, all be swept away in an afternoon if Turnbull drove through a vote in Parliament to amend the Marriage Act to remove the John Howard 2014 amendment limiting marriage to being between a man and a woman. The different treatment is a reflection of different views among the wealthy. Australia’s one per cent are united in their support of the U.S. alliance. It is why Labor and Opposition Leader Bill Shorten are also "joined at the hip" with Donald Trump in any war with North Korea. "Australians should be reassured that on this matter of North Korea and our national security, the politics of Labor and Liberal are working absolutely together." Reassured is not the word I would use, Bill. Fearful and disgusted are two words that come to my mind. Compare that unity of politicians over war to their lack of action over marriage equality. Unlike war, the wealthy are divided over equal love. To be more precise, the backward reactionary sections of the political class are vehemently opposed to marriage equality. 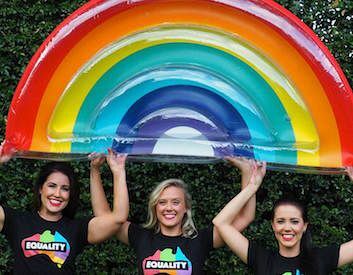 While polls consistently show two-thirds support for equal love, the figure is more like 50-50 among Australia’s politicians. Indeed, until recently, when the Labor Party decided to support marriage equality, "our" politicians mainly opposed the idea. Within the Coalition Government, the battle over equal love has to do in part with the division between the Abbott Austrosaurus and the Turnbull Tyrannosaurus. The Austrosaurans are winning. We have an Abbott/Turnbull Government. Turnbull’s machinations with plebiscites reflect his attempts to balance the forces of reaction and those of conservatism (laughingly called Liberalism) within the Liberal Party. The compromise was a plebiscite, which, because the Senate has rejected it once again, has now become a voluntary postal survey. The prevarication and pandering to reactionaries reflect a wider failure of democracy in Australia. On most issues, be they political, social, or economic, the majority of Australian people are currently well to the left of the politicians. Parliament has always been a bulwark against left wing ideas that might impinge on the profits of the one per cent. The wealthy are keen for cuts to social welfare to fund further tax cuts. The widespread opposition to the 2014 Abbott/Hockey Budget shows the narrow path the political class has to walk. This leads to inaction for fear of the political repercussions. Many in the electorate are fed up with inaction and just want Turnbull and co to get on with the job. He can’t, of course, but he can pretend to be leading by following Trump on war with North Korea and shaking his fist in anger at Kim Jong-Un from afar. War and oppression – for example, of LGBTI+ people – are expressions of capitalism. The U.S. has been at war for most of its 241 years of existence. Australia has been a loyal warrior alongside the dominant imperial power of the time – either the UK or the U.S. – since at least 1885 in the Sudan, if not earlier. Oppression of homosexuality – ranging from criminality in the past to denial of marriage equality in Australia today – reflects the centrality of the traditional family to the reproduction of the working class. The changing nature of the relationship between capital and homosexuality has its seeds in the rise of women into the workforce, the gains won by the activists and fighters in the women’s liberation movement, plus the combative approach of the gay liberation movement overseas and in Australia in the 1970s. The Stonewall riots in 1976 and the first Gay Pride march in Sydney in 1978, which police brutally attacked, show a more militant approach to winning rights. The voluntary postal vote, if it survives the High Court challenge, will unleash the bigots and their vile dehumanising of the gay community. This is intentional. The last gasp of homophobic reaction wants to wreak as much damage on the LGBTI+ community as possible before marriage equality is won. It is part of the systemic oppression of the gay community that is the grundnormfor reaction — or one of them anyway. This means the "Yes" case has a number of tasks. We need to begin organising immediately to get young people to enrol or to update their details. Second, we need to build a mass campaign that sends a clear message to those who might self-harm that we love you and we need you. Together we can win. A message to those who might be tempted to boycott or to shrug and say it is not an important issue is that not voting "Yes" is a victory for Tony Abbott, the main spear carrier for inequality. And if the High Court does invalidate the postal survey, the Turnbull Government will do nothing until it is voted out before the next election. That just reinforces the need to build a mass campaign to win equal love now. As unions say, an injury to one is an injury to all. Fight for and win marriage equality.